Like the 17 year periodical cicaida's, The Mants have come out of hibernation. Their last record came out in the late '90s and these huge insects didn't go away, they just went underground. You can see right away they use their guitars to shoot some kind of beam into dogboy looking humans which melts the flesh off and turns them to skeletons. Now with Halloween coming they can basically walk around and play shows with impunity. I've been reading their facebook posts and they hate humans! Referring to us as filthy ape-descendants and still I'm covering their single. I'm not sure if these things are from another planet or where they learned English but why are we letting them get away with this! Because they rock? You win, where do I surrender. A-Side "Destroyed by Fuzz" has a scuzzy Hussy style guitar blowing in with that pop punk scum, not that they didn't warn us. It's fun and spazzy, in a goofy Cramps camp that announces who they are in the song and proceeds to tell you how they will destroy you with fuzz. This isn't some kind of garage threat, they are walking down the reverse sleeve of this single as giant mantis alien. I pray they wear these on stage, I want the complete scene, taking it all the way to the venue and playing their guitars with green claws. These mutants got too close to the nuclear waste in that movie and then became celebs after crash landing or something. I'm sure they have a song or two describing the Mants lore and maybe this is the only way they know how NOT to kill us. "Gimme Gimme Gimme" is The Mants anti-consumer anthem, and Andy's vocals are clipped with distortion singing about buying shirts and records, but what if it's Mants merch? Is it ok then? Even with the two of these tracks, there's lots of room left on this side. The rest of the band joins in the chorus, gritty with a sense of humor like The Mummies or really any number of halloween friendly bands to provide that adult thrill of drinking at a bar watching aliens attack these tracks with lots of attitude and power chords, singing along of course. I guarantee they are playing the 31st somewhere. 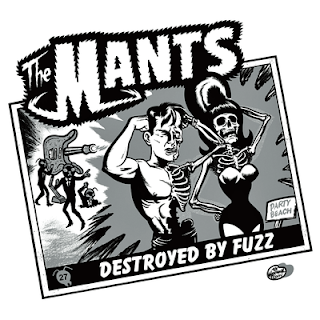 It was made for The Mants. B-Side "Just Don't Care" has a solitary kick in a solid trample beat for the bass and guitar to drop big chords in. Now these guys are singing about going to music school and dumbing everything down for the audience. This is hilarious, the stomp, windmill strums and cymbal crashes like some kind of swampy B-movie Art Brut, or Adaptation where they tell you everything they're about to do and then get away with doing it right under your nose. "Bug Out" has a dirtier punk sound with the speed of these chords or their power change that reminds me of "TV Party Tonight". They just want to have a good time, throwing heavy bricks of chords in a single made out of cinder blocks with holes for windows. Man they go crazy on halloween though with the spider webs and animatronic zombie torsos. This one could involve the most screaming chorus of the bunch, their good time is gong to get you. Then they'll break out that laser on the audience. Get it on fluorescent lime green vinyl from Manglor Records.